Blogging for Alphabe-Thursday, Jenny is hosting weekly parties working through the alphabet and lucky me, this week is P, Pretty, Paris, Postcards sytled into unique Postal Art by Pearl Maple. 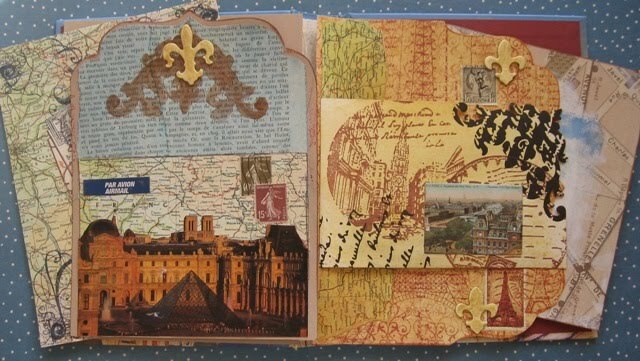 Some parts are from lovely postcards that my friend JoJo Caramel sent from France, stamped images from Tattered Angels other images from Altered Pages and maps are from an old atlas. 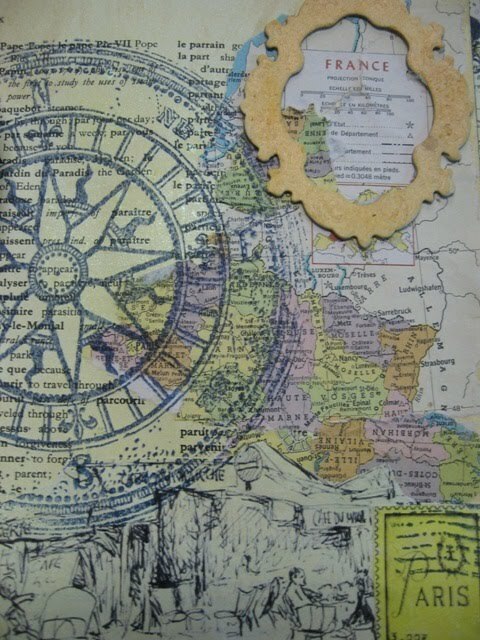 Geography was my favourite subject in school, can’t you just tell. 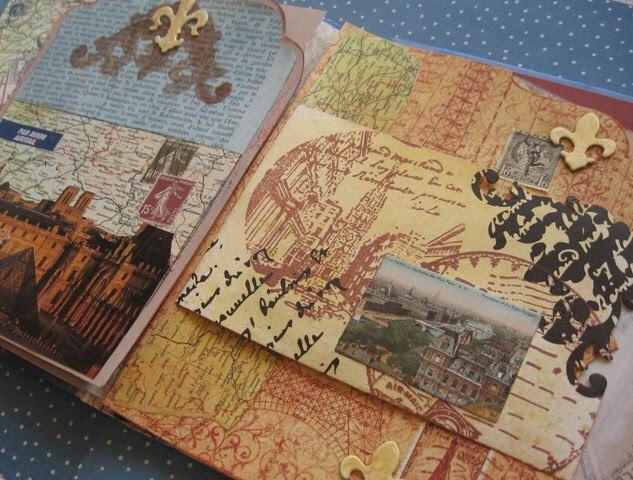 Destinations is a lovely theme and thank you to Evelyn for hosting the Carnival of Post Cards where groups of bloggers celebrate the beauty and history of post cards and mail art. 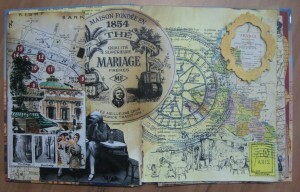 You know I like to play with altered books and I really should have taken a photo of the little post cards from Paris that JoJo Caramel sent to us to restyle in a new creative adventure. Update: another French themed party we are linking too is Frenchy’s, sure is a popular theme! check out here give away competition while you are there. 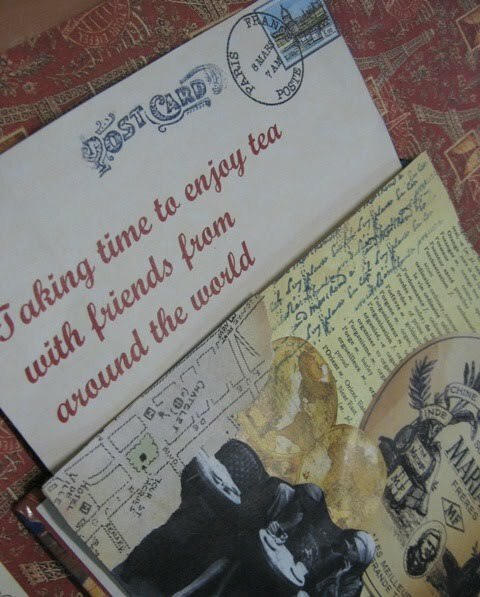 This month’s theme in the Carnival of Postcards is geography so I have included maps, lots of maps and even a little postage stamp with a globe on it. Here are the first few pages, keep checking back for updates as more pages are added. And as always, I confirm for my postcard & stamp collecting friends, all materials have been checked for signficance before being altered. Beautiful sky and scene!<br />Have a great week. 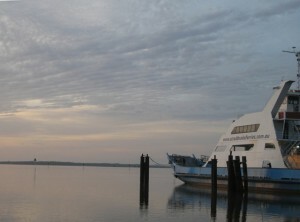 that looks like such a peaceful scene, i love when the clouds look like that, calm water too. really pretty! That quote surprised me – well the fact that Diane Sawyer said that. Beautiful capture. What a great capture! Love the scene, very calm water and the soft colour of the sky. I love the reflection too. Great pic of a peaceful scene. Love the sky colours reflected and the quotation quite apt for me today. So peaceful, – lovely shot. It looks like a beautiful day for a boat ride. The water is so calm. Joyeuses Pâques! Happy Easter Mandy! I loved all thos epost cards. Going to share them with my daughter tomorrow. She is in her 5th year French and will love to see those. OOOH! I love Geography too! I will have to find out more about this &quot;sky watch Friday&quot;. How pretty they all are!<br /><br />Thanks for sharing them..
Beautiful picture, intriguing quote – great post! My hubby collects antique post cards of Chattanooga….he needs to post them so thanks for the information. 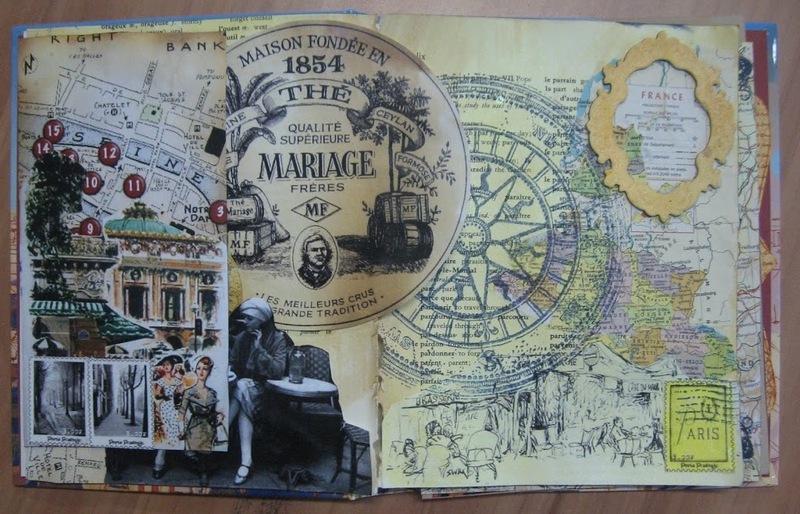 I adore altered books especially when you include lots of different mediums! Thanks for sharing! Beautiful photo and great post for alphabet Thursday. 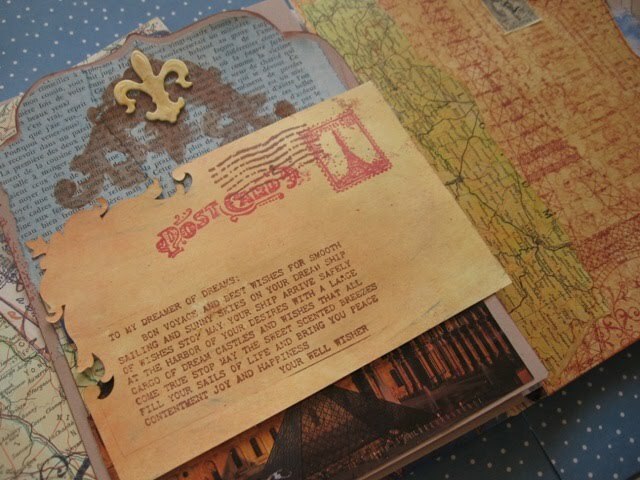 I love postcards…my grandfather collected them for years and had some that dated back to the 1800&#39;s.
I love postcards – used to collect them although nothing as lovely as you have here! oh i love the postcards … big tattered angels fan here! you have created some beauty! thanks for sharing it with us! So much intricacy and detail, layer upon layer to find delight in. This is beautiful. Your photos and journal looking altered books are lovely too. I really like the photo with the palm and the pathway by the ocean. 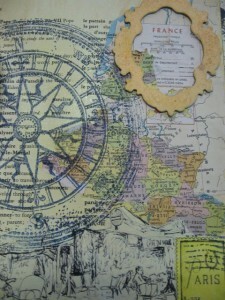 so wonderfull your handmade..<br />your so creative person..
What beautiful images you have on your blog Mandy. The water photos are my favorite. They are so serene.<br /><br />Thanks for stopping by today. I&#39;ll be back.